Starting a new thread for official news on congressional or special prosecutor actions re: the Russia investigation. The Russia thread will continue for the unofficial pieces that drip out from time to time (if they continue). News regarding Flynn might start going in here, not sure. I honestly wish I had something more clever than Trumptober. I can't help here, but I hope we get a Baba MAGA before it's all said and done. aside from liking the gif, I liked the juxtaposition of Eva not caring about criticism. Come on Trump, man up. Did the White House ever release a statement in regards to American citizens being attacked by Turkish security? AFAIK, only State has commented. I get impression he was cagey. Flynn officially pleading the fifth. So he doesn't want to incriminate himself. Says lots. They say a business can't claim the 5th. I predict worldwide popcorn shortages. 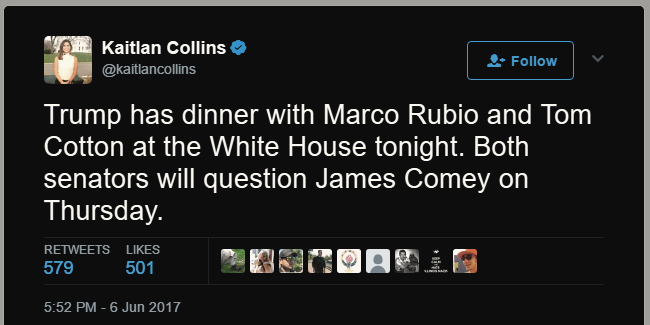 We need to set up a pool for how much Comey's gonna get smeared between now and the 8th. I honestly hope my schedule means I'm asleep when it happens. I don't think I'll be able to handle it live. Much rather rip the bandaid off instead of going all slow. It certainly easier that way. That said if nothing comes of it it'll be election night all over again. It's unlikely nothing will come of it, but also unlikely it's the killshot people want. I don't expect a killshot. My expectation is Comey will confirm he felt Trump tried to influence him, perhaps the investigation as a whole and that's it. And maybe some hints of further questionable actions are in his notes. Mr. Flynn initially refused to cooperate with a Senate subpoena, claiming his constitutional right against self incrimination under the Fifth Amendment. The committee then subpoenaed Mr. Flynn’s records from two of his businesses, which cannot be shielded by the Fifth Amendment. Cohen, of course, is one of the purported four to have had contact with the Russians during the campaign. Cohen confirmed to ABC News that House and Senate investigators have asked him “to provide information and testimony” about any contacts he had with people connected to the Russian government, but he said he has turned down the invitation. “I declined the invitation to participate, as the request was poorly phrased, overly broad and not capable of being answered,” Cohen told ABC News in an email Tuesday. Comeys statement for tomorrow is out. None of these witnesses invoked executive privilege or national security. They just didn’t want to answer. King finally blew up, scolding Rogers that what he “feels” isn’t relevant. He demanded to know why Rogers and Coats were not answering. He demanded a “legal justification” for not answering, and the witnesses did not supply any. Coats strongly hinted he would share information, just not in public, and that he would cooperate with the special prosecutor. My reading of the tea leaves is that they have nothing substantive to say about laws being broken, but perhaps more testimony that makes Trump and his staff look like muppets, as in the Comey statement. Perhaps they feel it is not in the national interest to make the president in to even more of laughing stock. Comey: "I hope there are tapes"
Comey spelling out the implication: When Trump 'asked' he took it as a direction. He got my talking point about the press. A little victim blaming going on here re: Comey not telling Trump off for his perceived request. McCains questions are real muddled here. Trying to tie in the Hillary investigation to the Russian one. He's confusing Comey. Yeah. I'm not even going to try to figure out what his point was. I think he was trying to paint Comey as unfair because the investigation into Hillary was closed and she was cleared but the election investigation which involves Trump campaign isn't. I know which gif you mean. Also thought McCain made no sense. And really, we all can hear Trump saying "you know, that thing we had" and imagine what he meant. It was a reminder of a promise. Comey interprets Trump actions as obstruction but leaves the final determination to Mueller. I don't know what Mueller can do if he agrees. It's unlikely the Trump campaign collided with Russians to influence the election. He also specifically noted he thinks Kislyak isn't an operative in his opinion. Wouldn't speak about VEB which I believe is linked to Kushners problems. Pence has retained legal counsel. Trump has seemingly confirmed on twitter he's under investigation. I don't believe him. He's a liar.